Osborne boasts interminably about success with his ‘long term economic plan’, but even the slightest scrutiny of the evidence shows that his claims don’t remotely stand up. Labour should be eating him alive. 1. After the 6-7% collapse of output brought about by the financial crisis, output per head has grown by less than 2% from 2010-13, whereas in the recovery from two previous recessions during 1981-4 and 1992-5 growth was over 8%. That difference between those 2% and 8% figures, largely caused by Osborne’s cuts, means that his austerity policies have cost the UK conservatively at least £100bn in lost production, equal to a loss of £1,500 for each adult and child in the country. That is a monumental failure of policy. 2. His failure over the deficit is equally dire. He promised in May 2010 that the deficit would be reduced to £37bn by the end of the fiscal year 2014-5 next month. It is actually about £97bn – more that two and a half times what he predicted. Yet he has the chutzpah to keep saying he has already cut the deficit by half, from its peak of £150bn in 2010 to £97bn now, a cut of less than 36%. Even that ignores two crucial factors. One is that most of that deficit reduction has happened despite his policies, not because of them, since the great majority of the reduction was due to the expansionary economic policies put in train by Alasdair Darling in his last two budgets in 2009-10. The other factor is that the rate of annual reduction of the deficit has markedly slowed and is now occurring at a glacial pace. 3. After the financial crash there was a serious shortage of demand, but Osborne’s austerity policies, instead of easing it, severely aggravated it. Despite the fact that his policies were the opposite of what was needed, he has had the luck of the devil through measures being applied from four other sources which have compensated for his own folly. First, £375bn was inserted into the economy through successive waves of quantitative easing. Then interest rates were ratcheted down to virtually zero – 0.5% for the last six years, the lowest by far for the whole 320 years of the Bank of England’s existence. Then because of the gross mis-selling of pensions and other financial products the banks were forced to disgorge £23bn in compensation to their consumers for their misdeeds. And finally, just in the nick of electoral time, the world price of crude has halved over the last 10 months, bringing inflation down to 0.3% and giving people for the first time in six years a marginal rise in incomes over prices. 4. Then Osborne has the shameless gall to claim that this was all part of his long-term economic plan! What is part, though, of the direct consequences of his own folly is that the trade deficit on manufactured goods is now running at nearly £120bn a year, productivity which is crucial to any sustainable rise in incomes is firmly stuck on the floor, private business investment is still distinctly sticky, household borrowing is now over £2 trillions and still heading north, and unemployment is still nearly 2 millions. 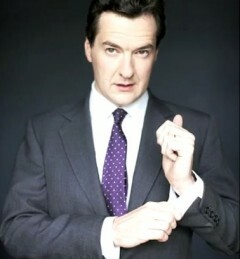 All part of your long-term economic plan, George? Posted in: Conservatives, Economy, Employment, Macroeconomics, Politics.